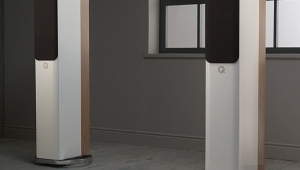 The lower woofer hands over to the upper at 90Hz, which in turn hands over to the midrange unit at 220Hz. 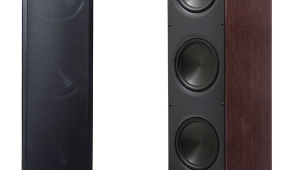 The midrange/tweeter crossover is at 2.2kHz, but no details are provided for the crossover topology, other than that it uses what Focal terms Optimum Phase Crossover Plus (OPC+). This includes the three sets of jumpers mentioned above, one each for the subbass, midrange, and tweeter. 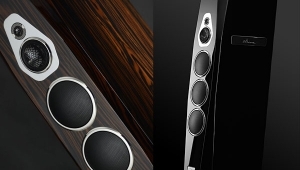 Each set offers three choices of position, labeled "1," "2," and "3," to allow the speaker's balance to be optimized for specific room acoustics. The middle "2" jumper positions are for nominal flat response; "1" reduces the low bass by 1dB and the treble by 1.5dB; "3" increases the bass by 1dB and the treble by 1.5dB. Setup was relatively straightforward for such a bulky, heavy speaker, thanks to the casters and the fact that the intelligently designed crates include their own loading ramps. Ian McArthur of Focal's North American distributor, Audio Plus Services, helped me maneuver the Maestro Utopia IIIs into my listening room. Using a CD of music with which he was familiar, MacArthur moved each speaker an inch or so at a time from its initial placement, until the tonal balance was what he felt was representative of the speaker. He then fine-tuned the jumpers. Having set up many speakers in this room, I was surprised by how tolerant of setup the Maestro Utopia was. 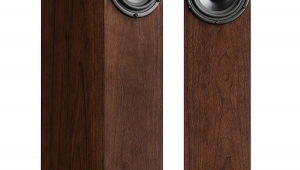 With some high-performance speakers, the difference between superb and merely okay sound can involve very small changes in position and toe-in. 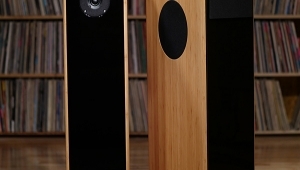 By contrast, even when we had first placed the speakers where we merely thought they might work best, the Maestros sounded excellent. The fine-tuning was just that: fine tuning. 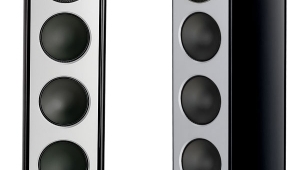 A circular, black grille is supplied for each driver; the one for the tweeter is magnetically attached. MacArthur felt the speakers sounded best with the grilles removed. Having declared himself satisfied with the placement of the speakers and the jumper settings, he then fitted the carpet-piercing spikes, packed up his tools, and drove back to the airport, leaving me to live with the Maestro Utopia IIIs. 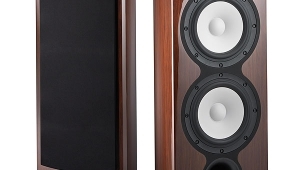 After my experience with the Focal Electra 1007 Be bookshelf speaker, which I reviewed in June 2006, I expected a lengthy break-in period, but the Maestro's balance changed very little after the first day's use. I had found the 1007 Be to sound brilliant; by contrast, the Maestro Utopia was, if anything, a little on the mellow side, even polite. Not that it sounded uninvolving, but instead of thrusting the music forward at me, it was more as if it were inviting me to hear into the music. 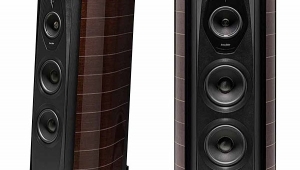 It took me a while to appreciate that, whereas some speakers are tailored to have a tonal imbalance that results in a polite sound, the Maestro Utopia III's decorum was due to the absence of things that speakers usually do wrong. 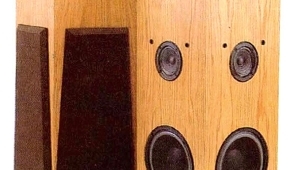 The big Focal didn't lack energy in any specific frequency region; instead, it lacked cone breakup modes in woofers and midranges, resonances in cabinets, and distortions of all kinds. 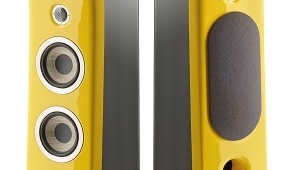 The speaker sounded smooth, yet without smearing or covering up recorded detail. The subtle touch of extra reverberation I had added with a Lexicon unit to the sound of Jerome Harris's direct-injected bass guitar in "Hand by Hand," from his Quintet's Rendezvous (CD, Stereophile STPH013-2), was as clear as I had hoped it would be, and a little more obvious than I might have wished. I had wondered about the Maestro Utopias' imaging, given the fact that the tweeter is set within a wide baffle, though this does have a slightly convex curve. I shouldn't have been concerned. 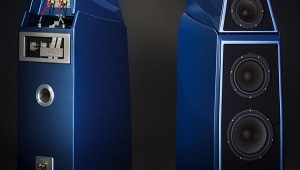 The dual-mono pink-noise track from Editor's Choice (CD, Stereophile STPH016-2) was reproduced as it should be: as a very narrow spot of sound midway between the speakers, without any splashing to the sides at any frequencies. The instruments on Rendezvous were stably placed in space precisely where I had mixed them to be, with excellent image depth where appropriate. Ian MacArthur had left the Maestros' tweeter jumpers in their neutral, "2" positions. Long-term, I preferred the balance with them set to "3," which took away most of the mellow top-octave quality. But, my goodness, this is one smooth tweeter, rivaled perhaps only by the Revel's beryllium dome. (I haven't heard the B&W diamond tweeter under familiar circumstances.) The Focal tweeter loved the sounds of cymbals, maximally differentiating among the various instruments used by drummer Billy Drummond on Rendezvous. For example, too often with less-aristocratic tweeters, the ride cymbal Drummond softly brushes throughout the first time through the verse on "The Mooche" sounds more like white noise. The Focal's inverted beryllium dome preserved the cymbal's changing texture, yet without pushing that character forward at me. At the other end of the spectrum, a consistent factor in my auditioning was how well articulated bass guitars sounded. Jerome Harris's solo in "Hand by Hand," from Rendezvous, was reproduced by the Focals with no undue emphasis or lack of same of any of the notes playedother than that intended by the performer, of course. In-room low-frequency extension, judged using the warble tones on Editor's Choice, was good to 25Hz, though the 20Hz band was inaudible. The lowest notes on my new reference for pipe-organ sound, Melanie Barney with the Buzz Brass Ensemble performing Holst's Planets (CD, Fidelio FACD028), didn't quite have the magnificence that they had with the Aerial 20T V2s, but nevertheless provided a satisfying foundation to the music. 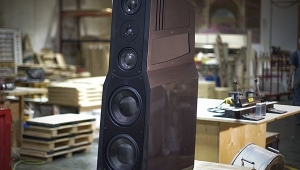 The Focal's woofers seemed tuned for clarity and articulation rather than for delivering the ultimate amount of low-frequency energy into the room. I ended up with the bass jumpers in their "3" positions, to add a touch more midbass energy.